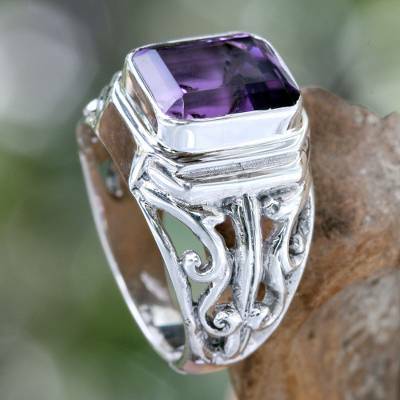 Nyoman Rena designs a handsome ring for men crowned with amethyst, stone of sincerity and spiritual wisdom. Rena crafts the sterling silver ring by hand, masterfully adorning it with artistic openwork. The gemstone totals 3 carats. You can find men's amethyst ring 'Wisdom Warrior' by Nyoman Rena in jewelry categories such as Birthstone Rings, Amethyst Rings, Silver Rings, Sterling Silver Rings and Single Stone Rings. Enjoy exploring these sections for other Novica treasures. "Exactly what I was hoping for!" I took around 9 months to finally purchase this ring. I didn't know what to expect. Initial impression...it's a perfect! It wasn't to small or to big. The workmanship, the look & feel of the ring was beautiful, stylish & comfortable. I'm happy that I ordered the ring! it is a beautiful, well crafted ring. Love it . Thank you so much. It fit perfectly. It is the perfect size. He loved it!! Thank you! Retired NY state trooper, bought this ring as the stone represents the color of the Preatorian Guard, the 1st Roman police. Rich purple color to the stone, and a great size stone. Good clean stone, decently cut. Good color. I like it! The Wisdom Warrior ring is better than advertised, It is masculine, beautiful, and sized accurately. I am not a jewelry wearer and bought this ring, have not taken it off (except to shower) since it arrived. "Beautiful and well crafted ring." First time I purchased a ring for me online and was not disappointed. I am ordering another ring from the artist because I was very satisfied and plan to treasure this ring. Amethyst stone and silver work are great. the color of the stone is beautiful! It is a rich deep purple color and the bezel and shank of the ring is very ornately designed. It can be (and has been worn) by both a man or a woman, even though it is advertsied as a man's stone. I love this ring and wear it everyday.